In my last blog, I told you about the research we were working on. Now published, it shows – all too predictably – that spending cuts are hurting millions across the country, not least our future generation, who are losing access to playground provision at an alarming rate. As expected, our second phase of Nowhere2Play research shows continued and significant decline. As national playground closures reach crisis point, with play facility spend slashed by nearly half (44%) between 2017/18 and 2020/21, a total of 347 closures since 2014 and a national decrease in playground spend of £25m by 2021, this is proving a huge false economy for local authorities. 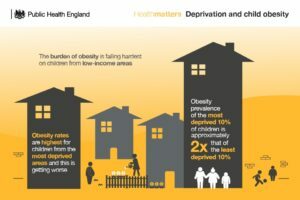 The childhood obesity crisis, coupled with the devastating impact on young people’s mental health that excessive screen time, stress and inactivity have, are taking their toll on public services. The social cost of these combined healthcare needs, the impact on children’s schooling and the cost of mental health support all mounts up. This is the true price of playground closures. And yet there is a simple and relatively inexpensive solution – to repair, replace and improve our current playgrounds. In the long run, a small investment from government now could save millions in the future and help to safeguard the welfare of an entire generation. Recent headlines highlight deep cuts in local authority spending across the country and the loss of essential services and facilities like playgrounds. At the same time, the media is full of accounts of growing mental health problems, the obesity crisis, and the impact of loneliness and depression in communities. Our latest research shows a significant drop in English playground provision – 70 have closed this financial year and a further 44% cut to playground spend is planned up until 20/21 – an estimated reduction in council spend of £25m. 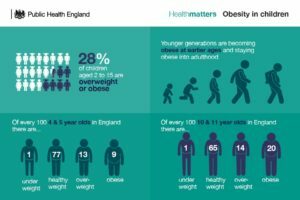 Government research in 2015/16 found that nearly 20% of children aged 10 to 11 were obese and a further 14% were overweight. Even more worrying is that 9% of 4 to 5-year olds were obese and almost 13% were overweight. Unless tackled early, childhood obesity can continue into adulthood with potential for causing health implications such as type 2 diabetes, heart disease and cancers. In 2014/15 the NHS spent £6.1 billion on weight-related ill-health, and annual spend on obesity and diabetes treatment totals more than that spent on the police, fire service and judicial system combined. Furthermore, the knock-on impact of obesity in wider society is estimated to cost the economy £27 billion per year. Fresh air and exercise are hugely beneficial when it comes to mental and physical health; a recent US anthropological study has compounded the link, showing a lack of free play could cause a rise in children’s mental disorders[ii]. An article published in the Lancet[iii] connected a reduction in play space available to children at home[iv] to increased stress and found that more free, outdoor play directly correlates with reduced stress in children, dramatically improving their mental health. It is more important than ever that play is prioritised by government. As the body representing the industry which supports and enables outdoor play, the API will continue to lobby and engage key decision-makers on central funding. Our screen-obsessed and time-poor society is increasingly focused on false economies, neglecting the crucial role of free recreation facilities for children and young people. In the face of huge and mounting challenges affecting our youngsters, problems which can become entrenched for life and costing the economy billions overall, it seems a no- brainer to prioritise protecting our playgrounds. We all have memories of playgrounds – they are part of the building blocks of childhood and vital for child development. They provide communal, free and attractive focal points for communities – rich and poor – and for children of all ages and abilities. With the cost of repairs and replacements to these facilities being dwarfed by the social cost of removing them, we insist that no child should find they have Nowhere to Play.